2.1 What Is A Natural Toilet Bowl Cleaner? Are you tired of having your toilet look like nobody has cleaned it for at least 2 months? Yeah, toilet bowls can and do get very dirty. They get full of human waste, dust builds up, and then you have all of that calcium, lime, and other minerals that cause deposits in the toilet bowl. When it comes down to it, toilets are pretty dirty things. Of course we do our best to keep them clean but the problem is that we often resort to poisonous and chemical-filled cleaners. Not only are these actually quite expensive, but they also aren’t healthy. It’s not safe to get many of these products on your hands, nor is it safe to inhale the fumes. Then there are the massive destructive environmental impacts which chemical cleaners come with. The better option is to use a natural option. Natural cleaners can be very effective, they are safe, eco-friendly, and they can be cost friendly too. So, let’s get to it and help you find the best natural toilet bowl cleaner that your money can buy. Here we have a selection of 10 natural toilet bowl cleaners that you can take a look at. Each of these options is natural, eco-friendly, safe, they work really well to clean toilet bowls, and they won’t blow your budget out of the water either. This is a 100% natural and eco-friendly toilet bowl cleaner. 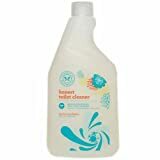 Eco-Me Natural Powerful Toilet Bowl Cleaner cleans toilets using natural plant essential oils. They work to break down bacteria, plus they are great for deodorizing toilets. This product is both septic and gray water safe, which means that it will not harm animals or plants when it goes down the drain. This cleaner is 100% non-toxic, and it does not leave behind any nasty fumes. It doesn’t contain ammonia, bleach, or any other harsh chemicals found in regular toilet bowl cleaners. Just in case you were wondering, Eco-Me Natural Powerful Toilet Bowl Cleaner is made in the US. 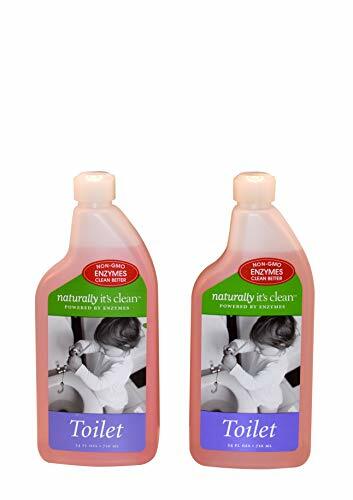 Naturally It’s Clean Toilet Bowl Cleaner is made with plant enzymes. There is just nothing better than plant enzymes when it comes to killing odors, breaking down waste, and getting rid of nasty odors. This cleaner has not been tested on animals, it is cruelty free, it is pH neutral, septic and gray water safe, it is biodegradable, and more. It contains no VOCs, no propellants, and no other harsh chemicals. It is 100% natural, safe, and eco-friendly. It can be used to clean your toilet from top to bottom, including the tank, rim, the seat, and the bowl. All you have to do is spray on a generous amount of Naturally It’s Clean Toilet Bowl Cleaner, let it sit for a minute, then give it a little scrub and wipe it off. It really does not get any easier than that. If you need a natural toilet bowl cleaner that smells really nice, Boulder Clean Natural Toilet Bowl Cleaner is the way to go. This cleaner has a scent of eucalyptus and rosemary, both of which work very well to kill smells and leave your bathroom smelling fresh. 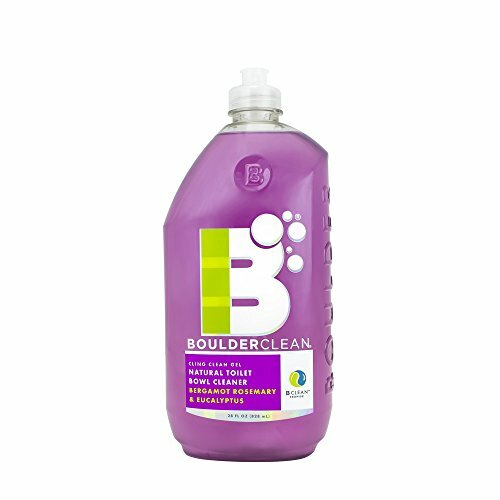 Boulder Clean Natural Toilet Bowl Cleaner works very well for hard water buildup, stains, and smells alike. It can be used for the bowl, rim, and everything in between. This cleaner does not give off any harsh fumes; it does not contain any harsh or unnatural chemicals; and it has not been tested on animals either. In terms of cleaning, it works well, but its main benefit and feature is that of deodorization. Natural HomeLogic Eco Friendly Toilet Bowl Cleaner is derived from plants and minerals. It takes the best of minerals, plant oils, and plant enzymes to create one heck of a cleaning solution. It is 100% all natural and does not contain any bleach, ammonia, chlorine, dyes, sulfates, formaldehyde, or phthalates. Even though it does not contain any harsh chemicals, it still works very well to break down waste, kill germs, get rid of stubborn stains and hard water buildup, and to eliminate bad smells. Moreover, Natural HomeLogic Eco Friendly Toilet Bowl Cleaner is made in the US, and it is septic and sewer safe, it is biodegradable, and it has not been tested on animals either. 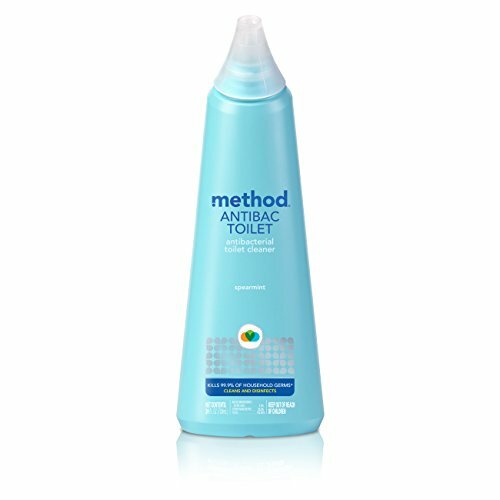 In our opinion, this is one of the very best options to go with in terms of natural toilet bowl cleaners. Not only does this cleaner come in a really fancy and nice-looking bottle, but it actually works too. 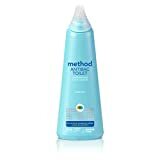 If you need something that is going to cut down on grease, hard water stains, and kill smells, the Method Antibacterial Toilet Bowl Cleaner is a great option to keep in mind. You know that spearmint gum that you love chewing? Well, this is what this particular cleaner smells like, spearmint. This cleaner contains absolutely no poisons, chemicals, or manmade ingredients of any kind. It is indeed 100% natural, biodegradable, and septic safe. Even the bottles are made out of 100% recycled plastic, so you know that you are being environment-friendly. This is the first option on this list of its kind. Instead of being a cleaning liquid for spot cleaning, such as when it is time to clean the toilet, this is a preventative and constant cleaning measure. 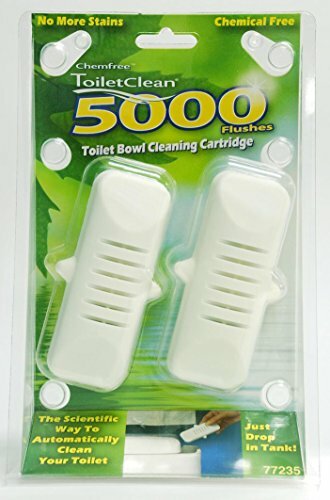 Here you get ChemFree Toilet Cleaner cartridges which you hang on the inside of the toilet bowl, right under the rim where the water comes out. When you flush, it releases some of the all-natural cleaning liquid into the toilet and around the bowl. It helps kill odors, and break down hard water and kill germs as they are created. These are safe for kids, pets, sewers, and septic systems. The ingredients used are all natural, chemical free, biodegradable, and eco-friendly. ChemFree Toilet Cleaner is also ideal for preventing fungus and mildew buildup, plus it is great for deodorizing. 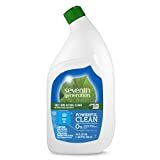 When it comes to getting rid of grease, waste, and smells in your toilet, Honest Toilet Cleaner – Septic-Safe, Natural Toilet Bowl Cleaner is another great option to go with. 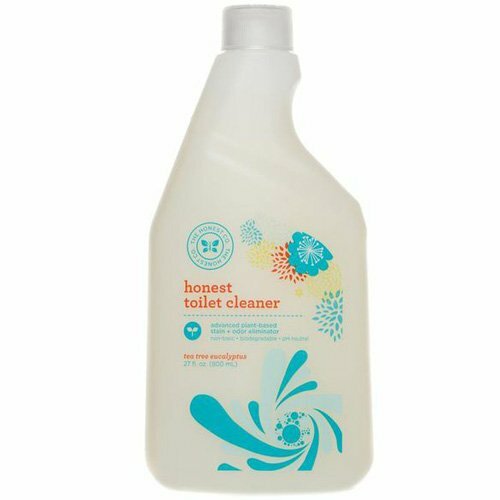 This cleaner is made with tea tree oil, citric acid, and other plant-based compounds which work together to eliminate stains, break down hard water, kill germs, and get rid of nasty odors. Also, it uses eucalyptus, which kills germs on its own, in order to get rid of smells. Honest Toilet Cleaner – Septic-Safe, Natural Toilet Bowl Cleaner leaves your bathroom smelling fresh and clean. It’s all natural, doesn’t contain poisonous manmade chemicals, it is sewer safe, and 100% eco-friendly. Do you like the smell of real and natural lemons? 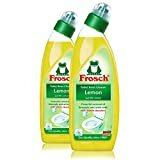 Well, if you do, Frosch Lemon Toilet Bowl Cleaner is probably a good option for you. This cleaner smells strongly of lemons and it does a great job at killing urine and waste smells, plus it leaves your bathroom smelling fresh for days to come. This cleaner is 100% vegan and cruelty free, and it doesn’t contain any harsh chemicals. It’s biodegradable, it won’t hurt animals, and it is 100% all natural. 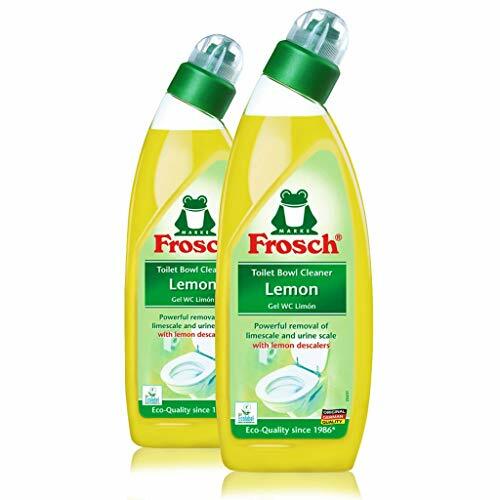 Frosch Lemon Toilet Bowl Cleaner does a great job at breaking down waste, killing germs, and leaving your toilet bowl squeaky clean. This is another of the all-natural toilet bowl cleaners that are made with plant-based components. It uses plant oils and enzymes to clean your toilet, and to keep it fresh. The ingredients are biodegradable, sewer and septic safe, and environment friendly too. There are no harsh or unnatural chemicals in this cleaner. Seventh Generation Toilet Bowl Cleaner is perfectly safe to flush down the drain. The plant enzymes are fantastic for breaking down stains, hard water buildup, for killing germs, and for neutralizing odors. This is the final option on our list of natural toilet bowl cleaners, but it certainly works just as well as any of the others we have talked about. Now, this cleaner is made with 98% naturally derived ingredients. 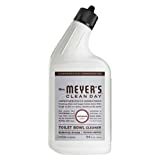 Yes, Mrs. Meyer’s Toilet Bowl Cleaner does contain a couple of chemicals, but they are really nothing too bad or harsh. This cleaner is biodegradable and environment safe. It is chlorine and solvent free, but it still does a great job at getting rid of hard water buildup, stains, germs, and of course smells. Before you buy any kind of natural toilet bowl cleaner, there are some things to think about. Let’s go over some of the most important things to keep in mind, not only when selecting a natural toilet bowl cleaner, but also about cleaning your toilet bowl in general. What Is A Natural Toilet Bowl Cleaner? You are probably familiar with normal toilet bowl cleaners. A lot of the time, they come in that bottle where the head looks like a duck. Yeah, that one, the one that makes it easy to squirt that thick blue or green liquid under the rim of the toilet. However, that cleaner, while it does work, comes with its own problems. Generally speaking, that cleaner is chalked to the brim with poisonous chemicals. It’s so toxic that you would never want to get it on your skin. It’s full of ammonia, bleach, chlorine, and a long list of other chemicals that are not healthy for you, the environment or anything at all. Natural toilet bowl cleaner will still clean your toilet. However, instead of being chemical, manmade, and highly toxic to just about everything it comes in contact with, natural toilet bowl cleaner is made from 100% natural and eco-friendly ingredients. Instead of manmade chemicals that will strip the paint off of wood, natural toilet bowl cleaner is derived from nature, usually plants. The vast majority of natural toilet bowl cleaners use plant enzymes and natural compounds like hydrogen peroxide to do the exact same job which other cleaners do with ammonia, bleach, and chlorine. In layman’s terms, it is an all-natural and eco-friendly alternative to dangerous chemical solutions for cleaning your toilet bowl. If you are wondering how all-natural toilet bowl cleaners work, generally speaking, they mostly use plant enzymes. These enzymes come from natural plant matter and they work to eat away and kill bacteria, solid waste, odors, and anything else which you might find in your toilet. Plant enzymes are very powerful and will eat through human waste in no time at all. These enzymes are usually both anti-bacterial and anti-microbial, plus they work well to get rid of things like calcium and lime, plus bad odors too. Some of these natural toilet bowl cleaners also use acids like lemon, vinegar, and other acidic ingredients to break down waste and dirt, and to kill germs. Others yet might use ingredients like hydrogen peroxide, or any number of essential oils with germ-killing, protein-eating, and odor-controlling properties. There are a few different types of toilet bowl cleaners, with the main distinction being between chemical toilet bowl cleaners and natural toilet bowl cleaners. When it comes to chemical toilet bowl cleaners, there are those which use ammonia, ones with bleach, and others that use chlorine, plus there are some others too. These ingredients do in their own way serve to disinfect toilets, break down waste, and kill odors, but they are also highly poisonous to us, the environment, and animals. The other type of toilet bowl cleaner which is the all-natural kind. These cleaners don’t hurt the environment, they don’t kill plants or animals, and it’s not terrible if they make their way back into our drinking water. Some toilet bowl cleaners use simple acids to kill odors and germs, things like lemon and vinegar. Others use essential oils with cleaning, grease cutting, and anti-bacterial properties. Some use hydrogen peroxide, which is a germ killer. Others use plant enzymes. Plant enzyme toilet bowl cleaners are some of the best natural options out there as far as we are concerned. Plant enzymes work really well to break down human waste, kill germs, and neutralize smells too. However, if you want something truly effective, a combination of these natural ingredients is best. On a side note, there are toilet bowl cleaners, both natural and chemical, which are used on the spot for general cleaning purposes. There are also those which you can hook onto the inside of toilet bowls. These release a little bit of cleaning fluid every single time you flush the toilet, thus washing away dirt, killing odors, and breaking down waste as it is created. You might think that natural toilet bowl cleaner could never work as well as that poisonous chemical-filled duck-shaped bottle; however, you would be wrong. Natural toilet bowl cleaners come with many different benefits, and one of them is that they are super effective at what they are designed to do. Just because they are made with natural ingredients does not mean that they cannot effectively clean toilets. 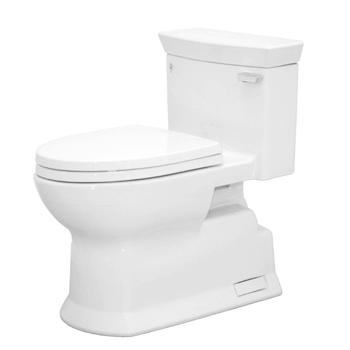 Therefore, one of the main benefits of natural toilet bowl cleaner is a cleaner toilet bowl. The ingredients which these natural cleaning products use have the power to break down things like calcium and lime, they break down natural waste made by us, they remove stains, and yes, they get rid of toilet odors too. In other words, the biggest benefit you get with a natural toilet bowl cleaner is a sleek, shiny, and fresh-smelling toilet. The ingredients used do just as good a job at cleaning toilets, cutting down on odor, removing greasy residue, as breaking down natural proteins as their chemical-filled counterparts. Of course, the obvious benefit of going the all-natural way is that you are not hurting the environment. Chemical cleaners have a lot of detrimental effects on the environment. They are filled with chemicals that can cause huge anatomical and hormonal changes in animals. Moreover, these cleaners are downright poisonous. The compounds they contain poison the animals which are forced to live in and drink the water which goes down the toilet or the drain after you are done cleaning. Just imagine going for a swim in a pool of ammonia and bleach. Yes, that is how frogs and fish feel. There is also the fact that these chemicals kill plants, the very same plants which provide us with oxygen. Then there is the point that those same chemicals used to clean toilets eventually make their way back into our drinking water. Yes, water treatment plants may be able to remove most of the chemicals, but never all of them. So, chemical cleaners kill plants, they kill animals, and they end up being ingested by us. These are all things that you do not get with all natural toilet bowl cleaners. To be quite honest, natural toilet bowl cleaner really does not come with many problems, if any at all. OK, for one they might be comparably expensive. Yes, there are some all-natural options which can be quite pricey. However, for every 10 natural cleaners that are expensive, you can find at least 1 that is still cost effective. Price is really not an issue here. Another problem is that they often don’t smell too nice. Yes, chemical toilet bowl cleaners can be scented to smell like pretty much anything, which some people like. However, sometimes the smell of these is not nice either. Either way, many natural toilet bowl cleaners don’t always smell pleasant, and if they do, the smell often does not last too long. A select few natural toilet bowl cleaners might not work so well, especially on built-up dirt. These are best used regularly, and partially as a preventative measure too. It really does depend on the ingredients being used. Some natural cleaners are better than others, but then again, this can also be said for chemical toilet bowl cleaners. In terms of actually cleaning and maintaining your toilet, we will let you use your own judgement here. However, one important thing to keep in mind is that regular cleaning is always best. It’s much easier to clean a little bit of mess on a regular basis, than it is to clean a huge mess every now and again. Bust out those rubber gloves, get your natural toilet bowl cleaner, and your toilet scrub brush. It’s really all you need! Remember that a natural toilet bowl cleaner can be just as effective as that chemical-filled cleaner. Sure, there might be some chemicals that work better than natural ingredients, at least sometimes. However, that chemical-filled cleaner is often actually very expensive. There’s also the fact that all of those chemicals damage the environment and the world around you in a really big way; even the manufacturing of those cleaners hurts the environment. A natural toilet bowl cleaner is a safe, easy, functional, and cost-effective way to keep your toilet bowl looking brand new.